Sometimes the Misadventure, Deaths and Near Misses (MDNM) posts are like a newspaper version of Funniest Home Videos (I’m thinking of the horse in the sidecar last edition), but there is, of course, a serious side. 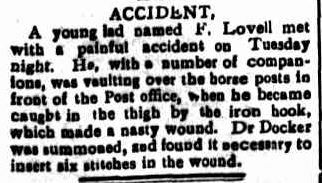 The accidents of Western District pioneers remind us of the dangers they faced in their everyday lives. Even mundane clothes washing could turn disastrous. Fire was ever-present in early homes for light, cooking, warmth and washing. That led to many injuries and women were the most likely victims simply because they worked with fire often and their long dresses were prone to catch. My own family did not go unaffected by fire. My ggg grandmother, Ellen Gamble, lost her life in a house fire from a knocked candle and my ggg aunt, Jane Diwell passed away after catching fire while boiling turpentine and beeswax. Newspapers articles on the danger of fire were often published. The following ladies all had accidents with fire and for each it was their impractical dresses that contributed to their injuries. In 1889, Jane Brennan was travelling home from mass with her husband and son, when the boy smelt smoke. They blamed a hot axle until they found Jane’s dress on fire. Despite her husband’s desperate attempts to douse the flames, Jane received severe burns. Mr Brennan also had bad burns including his fingernails burnt off. Despite being transported to the Ararat Hospital, a later edition of The Portland Guardian reported Jane had sadly died. The cause of the fire was unknown. For Constance Sarah O’Connell of Heywood and Eva Dyson of Bessiebelle, it was domestic duties that resulted in their burns. Mrs O’Connell was tending a copper in the backyard of the Commercial Hotel, Heywood where she worked, when her dress caught fire. A doctor was called from Portland to tend Mrs O’Connell’s burns but the poor woman was sent by afternoon train to Hamilton Hospital where she later died. I am curious why she did not go to Portland, closer than Hamilton. Eva Dyson was carrying out her household chores in front of a fireplace when her dress caught fire. Her screams brought her mother and sister who were able to extinguish the flames but not before they all also suffered burns. A past edition of MDNMs discussed the frequency of headlines such as “Peculiar Accident” or “Extraordinary Death” in the papers. The death of Matthew Kelly of Eurambeen was definitely “extraordinary” or maybe just what can happen when a joke gets out of hand. 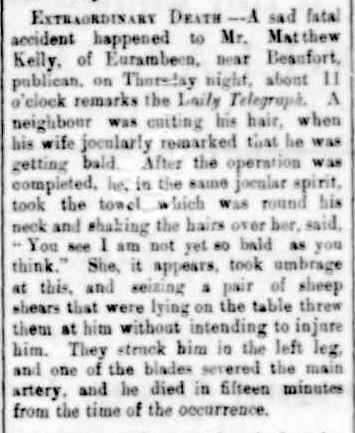 On July 25, 1888, The Portland Guardian reported that Mrs Kelly would stand trial over the manslaughter of her husband. I did not find an article about her trial and the result. A peculiar accident occurred at the Ararat Railway Station in 1922 and the cause was the railway bell. 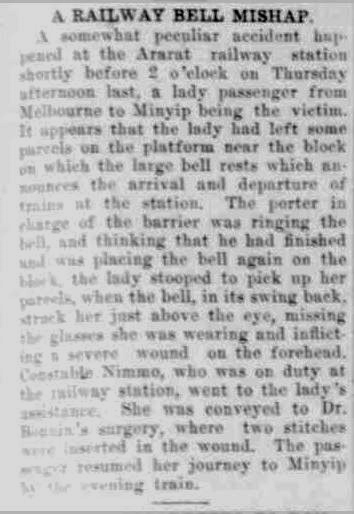 A Minyip lady received stitches above her eye as a result. It was a near miss for James Hadden, my gg uncle, working at a saw bench at Mt Sturgeon Station, near Dunkeld. The saw went between his fingers and while he suffered some nasty cuts, his fingers remained intact. On September 12, 1884, two “cowboys” rode up beside the mail coach between Nhill and Dimboola causing the horses to bolt. Both the driver and the only passenger Mrs Dungey of Kaniva, were thrown from the box seat of the coach. Fortunately they both survived but Mrs Dungey was badly injured. The driver managed to get the coach back in order, surprisingly with the help of the two culprits. They loaded Mrs Dungey and the driver took her to a doctor in Dimboola. The police investigated the incident, the second of its kind in a short period. Mr Shrive did something that still occurs regularly today. He fell from a ladder. 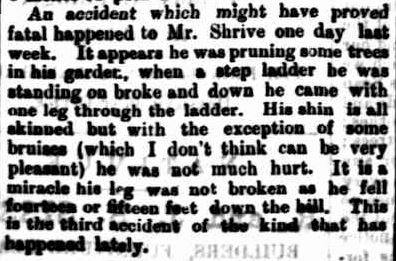 Notice Mr Shrive’s accident was the third of its kind around the time of June 1888. A bull had the last word when Mr D. Williams, a butcher, was attempting to slaughter it. The beast kicked its leg out, pushing the butcher’s knife into the lower arm of Mr Williams, inflicting a nasty wound that cut the artery. Albert Reed of Muddy Creek was my 1st cousin, 4 x removed, a nephew of my ggg grandmother Sarah Harman (nee Reed). He owned a cantankerous young Jersey bull that happily roamed the paddock but would not enter the cow yard. Until one day in August 1913 when it chose to jump the fence into the cow yard where Albert was standing. It immediately charged Albert and for sixty metres, it pushed Albert along the ground trying to lift him up onto its horns. Finally William broke free and called for help but the only person home was his mother Sarah Burgin, then 67. Between them they were able to secure the bull. It was later shot. F.Lovell of Portland had a very near miss! in 1889, Reverend Father Foley was on his way home from conducting mass at Goroke when he came across John Breen . John had fallen from a horse and had broken his leg. Rev. Father Foley constructed splints from the bark of a tree, lifted John into his buggy and transported him to Nhill hospital. Dr Ryan of the hospital was most impressed with the surgical skills shown by the man of the cloth. 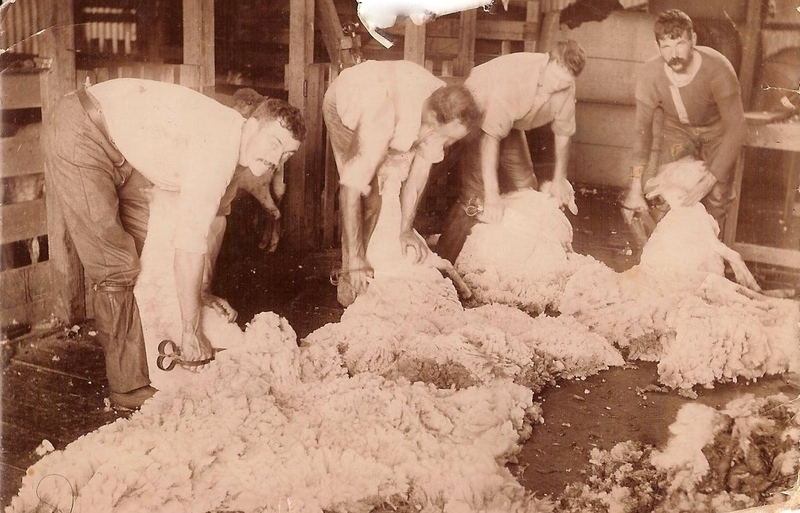 This entry was posted in Western District History and tagged Bessiebelle, Breen, Brennan, Dungey, Dyson, Goroke, Hadden, Horsham, Kelly, Muddy Creek, O'Connell, Reed, Rowley, Shrive. Bookmark the permalink.